This stylish contemporary sectional sofa will be a lovely addition to you living room ensemble. The generous plush seating is great for everyday use, with high back cushions and deep seats featuring a modern tufted look. 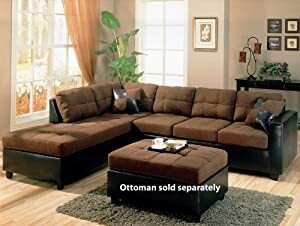 Covered in a soft microfiber fabric, the cushions are comfortable and durable, in a deep Chocolate, while the wide track arm and base is covered in a dark brown faux leather that is sure to complement your decor. Showing off a stylish two-tone look, this sophisticated sectional is finished with square throw pillows for just the right look, for a bold and cozy style that the whole family will love.